In brief: A kid gets given magical powers by a wizard that allow him to switch back and forth from adult superhero to regular kid. What I thought: I actually really enjoyed this! I had no idea really what to expect – early reviews suggested it was funny, but I don’t have the best track record with DC films which tend to be a bit grim and grey for me. 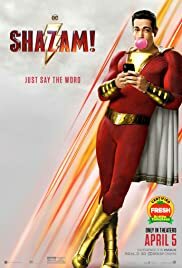 Shazam genuinely was funny, and poked fun at the genre the whole way through, but in a family-friendly heart-warming sort of way rather than the 18+-designed-to-push-boundaries way Deadpool does. It was just a fun, enjoyable story that offered some of the lightness and humour that DC has been sorely missing until now. In brief: Remake of Disney’s animated story about an elephant who can fly. What I thought: I went into Dumbo with really low expectations which almost certainly helped but overall I was pleasantly surprised. 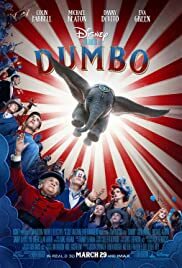 I really don’t remember Dumbo from when I was a kid, so I can’t comment on how true it was to the original, but I thought it was well done – whimsical rather than excessively eccentric as Tim Burton can be at times. The CGI is an unusual style but in a good way, it fit well with the obviously CGI baby elephant and the overall feel and aesthetic of the film. The world-building in Dreamworld is well done, with Disney parallels parents will probably spot even if the kids don’t. One minor irritation though was that the weather vane so prominently used in the trailer is of African elephants despite the fact there aren’t any in the film. Trivial point but it’s a strange detail to get wrong when it feels like they’ve done their best to make the rest of the world feel so believable. The story itself is pretty dark, and there were a few scenes that are just unpleasant to sit through. As a self-confessed wimp who loves elephants and has a tendency to get overly emotionally invested, I couldn’t say Dumbo was an enjoyable watch – while it was well done, it wasn’t for me, as the good moments were just overshadowed by the uncomfortable, miserable ones.